Found at the prestigious Cheltenham Festival and the Grand National, The Green Room is horse racing’s premier hospitality experience. 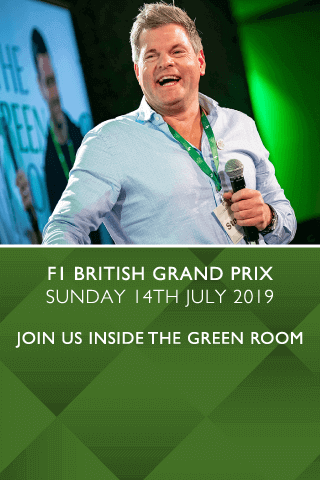 As an exclusive Green Room guest, you will not only be privy to some of the hottest tips from the greatest racing brains, but you will be at liberty to meet and question the very people who make The Sport of Kings what it is today. Providing a truly high-end offering, The Green Room immerses you in an interactive celebrity experience you’ll never forget. Cheltenham Racecourse was built in 1815 but moved to its current Prestbury Park venue some years later in 1831. Since that day, the popularity of horse racing has grown continually, and Cheltenham Racecourse now admits up to 260,000 spectators over the course of its Spring festival each year. The festival is one of the biggest events within the sporting calendar and is made up of four days: Champion Day, Ladies Day, St. Patrick’s Day and Gold Cup Day. Each event boasts an extensive and attractive hospitality package that turns your day at the races into one you’ll never forget. Our Green Room Horse racing hospitality packages provide guests with one of the finest experiences in the sporting industry, with access to interviews with some of the most famous Jockeys and trainers in the sport (conducted by Mark Durden-Smith), as well as a full complimentary bar* and four-course silver service luncheon. Our team goes to every effort to ensure that your day in The Green Room is extraordinary. We provide 5-star services throughout the hospitality experience and pride ourselves on the unrivalled levels of service and opportunities that we deliver to our customers. As a provider of high-quality hospitality packages for the country’s biggest sporting events, we are experts in creating exceptional experiences. We provide the best that you can get, in the form of our exclusive packages which are designed to make The Green Room horse racing experience like no other. Enjoy the exciting atmosphere of a day at the races with a bundle of added perks, including the finest food, drinks, and opportunities to meet and greet some of the country’s most well-known horse racing stars. Be confident that we can deliver what you’re looking for with our 5 star Trust Pilot rating - our customers come back to us year after year and rely on us to make their time with us luxurious and exciting, whilst providing secure and high-quality services. If you’re on a smaller budget but still crave the taste of luxury, our horse racing hospitality events are available to book. Other standard VIP packages include football hospitality, rugby VIP events, and luxury golf tickets. Discuss your ideal package with us today. As well as horse racing at The Green Room, we also host a wide range of other sporting events throughout the year courtesy of the ultimate, including The Green Room Cricket, Rugby Green Room matches, or you can immerse yourself in The Green Room at motorsport.